Conventional coffee processing is responsible for destroying roughly 3 square cm of forest for each cup of coffee we consume! By eliminating the need for firewood in the coffee drying process and harnessing solar energy instead, Cafe Solar® is saving thousands of hectares of rainforest each year. Cafe Solar® uses clean, reneweable energy, it’s grown organically, and it’s pioneering an innovative growing method (called, Integrated Open Canopy), which increase the diversity of tropical bird species and allows or controlled rainforest restoration. The Fair Trade certified Honduran coffee co-operative (“Co-operativa COMISUYL”) is encouraged to work together in order to build and support their local communities, and this in turn creates a lively coffee-growing culture throughout the region. The co-op is managed by a group of women who are promoting gender equality and advocating for sustainable growing and trading practises. Cafe Solar® is also improving the livelihoods of the local Hondurans by providing job security and diverse, new employment opportunities. The off-grid processing centre provides skilled training in construction, operations and maintenance management, in addition to employing local youth who would otherwise be forced to move to urban centres. Cafe Solar reduces the amount of time and energy required for processing large volumes of coffee, which leads to greater rewards for farmers and co-op members who operate the off-grid processing plant. Buyers also benefit from Cafe Solar® because it is a truly secure supply of premium-quality coffee. 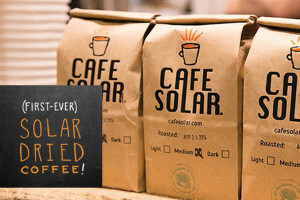 End consumers (all us coffee-drinkers) are also given an incentive to buy Cafe Solar, in the form of guaranteed fresh, great-tasting and good-feeling coffee. For more information, visit: www.cafesolar.com/ or drop by the Merchants of Green Coffee at 2 Matilda Street.